Bubble tea frenzy continues.. For those that may be keen to know what are the bubble tea brands available in Malaysia, one should go around shoplots near to Inti at SS15, and chances are, you will get to see majority, if not all the bubble tea players in Malaysia. 1 of the latest player in town is non other than Coco, which originated from Dansui, Taiwan. This outlet at SS15 is their 1 and only outlet in Malaysia, at present. Coco does distinct itself by having a cafe concept with its 1st outlet and I super duper love the ambiance. Extremely cosy seating area, and just the kinda place I like to chill in. Of all the Coco outlets (this is the 837th outlet internationally), this is the 1st with this cafe concept. 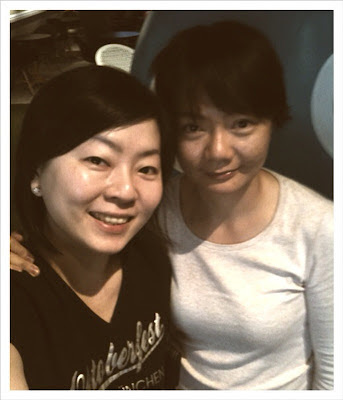 From far, one can't missed the cute cartoon face, with 2 big eyes, representing Coco. Got so excited when I entered "Coco".. Feel like taking picture everywhere. Love the really cute blue mascot. Selina & I. A picture with the mascot is a MUST.. hehe.. I love the different parts of Coco, that comes with different sets of furniture. Sit at different part of Coco, and you will get a slightly different feel, with its raw wall and wall pasted with artificial grass..
Oh! So am I more excited about the ambiance, than the drink?? Not so the case.... in fact I tried it when I was in Shanghai last year, and I absolutely fell in love with the drink called '3 Brothers'. And by the time I post this, I've came to Coco (and so I'm blogging from Coco, now....) a total of 4 times. 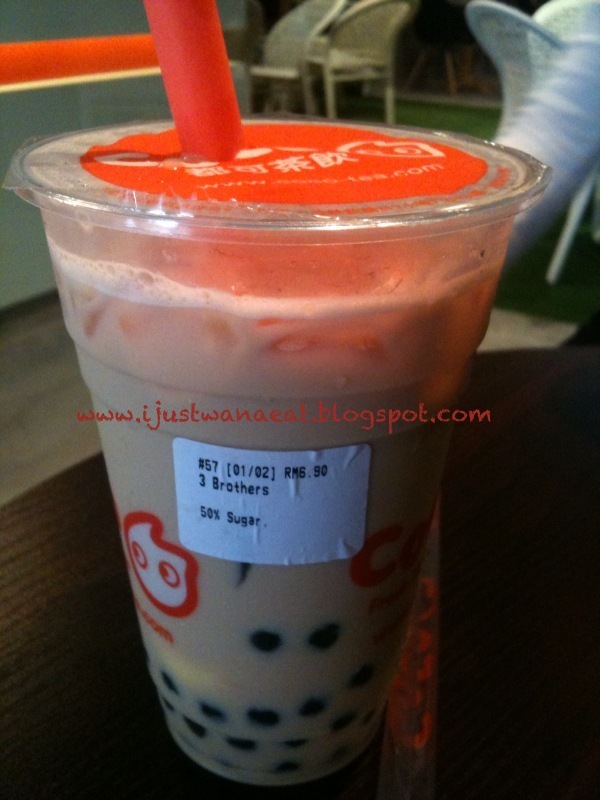 1st visit - I had the Mango Yakult drink - definitely a drink for the Mango and Yakult lovers. The taste of Yakult flavor is apparent as they use 2 whole bottle of Yakult in the drink. 2nd visit - I had the 3 Brothers. 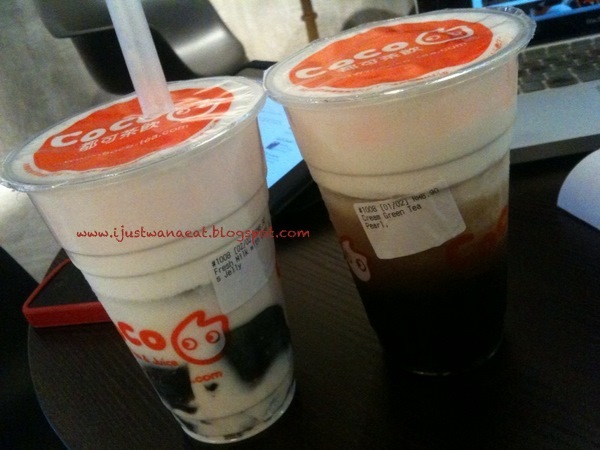 This drink will surely fills your stomach, as it is Milk Tea that combines Pearl, Grass Jelly and Pudding. Love the pleasure all this 3 gives to my tastebud as Pearl has this chewy taste (I extremely like the texture of Coco's Pearl), aromatic Grass Jelly and the Pudding that is so smooth..
3rd visit - I had the Bubble Gaga. This is the Passion Fruit tea with Pearl and Coconut Jelly. Passion fruit is a taste you either like or dislike. I love the refreshing taste the passion fruits gives, with its sourness. 4th visit - Selina and I shared drinks. We had the Cream Green Tea with Pearl and Fresh Milk with Grass Jelly. Of all the 4 visits, this 2 are my top favorite. The cream that comes on top of the Green Tea separate itself well, and the texture is extremely smooth. With its slightly salty taste made from their own recipe, makes you wanting for more. I also like the idea that they gives you this small plastic knife to cut the cover, so that you can take good sip, starting from the cream, up to the tea. I was also pleasantly surprised with the aromatic Green Tea flavor of this drink. As for the Fresh Milk with Grass Jelly, yummy too!! The aromatic of the brown sugar used in the Grass Jelly is apparent and its goes so well with the milk. What else should I try next??? Hmm..
2 Response for the "Coco @ SS15, Subang Jaya"